Blue door, what’s that secret you’re hiding…? It’s almost the end of the TGO Challenge, and after swapping tales and enjoying the convivial atmosphere at Tarfside, you face the steady plod to Edzell (and the joys of the Tuck Inn) and then maybe take the path alongside the post office to find the ‘Shakkin’ Brig’ and eventually the long road to North Water Bridge Campsite. So far, so familiar, and if you’ve done this a couple of times before ... so boring! Here’s a detour from the familiar trade route, offering stunning riverside scenery, woods and wildlife – and no cow dung! Plus its all quite hidden away from the trudging column of footsore (and probably headsore) Tarfside wayfarers. And it begins for us at the ‘Rocks of Solitude’. It was the name that attracted me – Rocks of Solitude. So a few years ago I diverted from the usual Challenge route on the track west of the river and crossed the bridge at NO574753 and hopped up onto the road. About 3k down the road there is a sign to the ‘Rocks of Solitude’ and, as you descend to the river, an information board which gives no real hint of the delights to follow. The beautifully constructed path, hacked out of the rock by napoleonic prisoners of war, generally keeps above the river gorge; there are smaller paths down to fishing beats, but the main path is pretty obvious. The woods above teem with wildlife and birdsong, the North Esk crashes wildly through the rocks below. 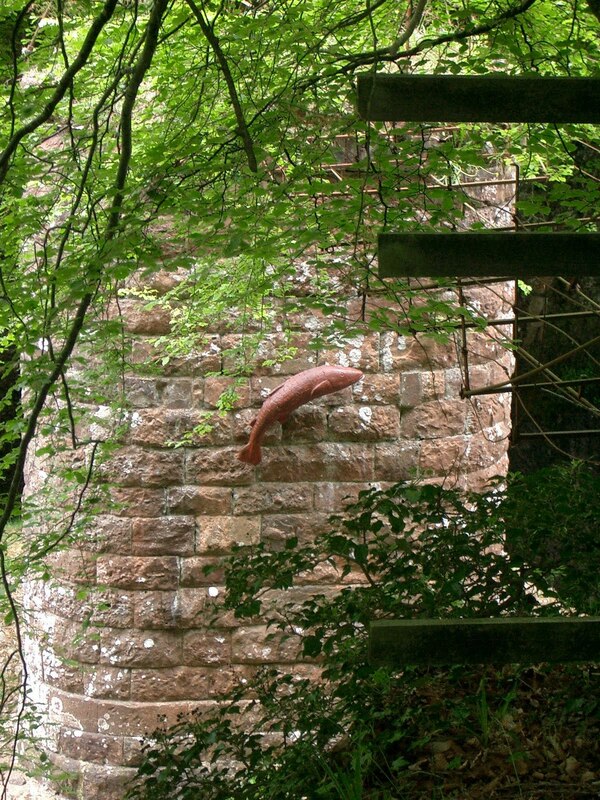 This is a salmon river, and its value to Victorian and Edwardian sportsmen is marked by the salmon sculpture on the rather beautiful ruined bridge. It’s just over 2.6k before the path leads you to a blue door set in a wall. It’s a little low door – rather hobbit like. You pop out through the blue door and suddenly you find yourself back in the real world – on the B966 at Gannochy Bridge with cars whizzing past. But although the main highlights are over, the walk continues in a pleasant enough fashion. 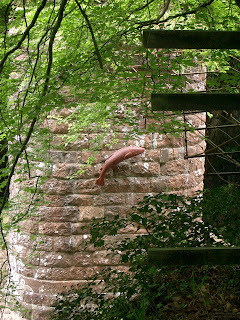 Cross the bridge and take the path on the opposite bank which leads all the way to Edzell and the Shakkin’ Brig, threading through beech woods with fields to the right and the river surging along its rocky bed below on the left. Walk past the wobbly suspension bridge and bear right to emerge in Edzell high street next to the post office. Then turn right to amble down to a well earned bite and cuppa (or even an ice cream) at the Tuck Inn. This delightful little diversion adds about 1k at most to the ‘conventional’ route. I enjoyed it – hope you do too! A delightful diversion and well worth taking, Sir.